It’s a boring museum, what’s a girl to do? Anna and her stuffed giraffe are on an outing with her mom to the art museum. Anna is a typical rambunctious youngster who finds the art museum’s rules just a bit stifling and the artwork old and boring. Or is it? While Anna set out to entertain herself, readers can entertain themselves with the witty juxtaposition of the subjects in the artwork seeming to react to what’s going on in the museum and the museum patrons mimicking the characters and activities in each scene’s artwork. It’s altogether too much fun to pick out all the similarities from clothing style, colors, and the body language and expressions. While Anna is bored and wandering, causing near disasters, a kind guard gives her permission to enter what seems to be a secret area. It’s where the paintings are meticulously restored and cared for. Anna finds that perhaps the subjects of the paintings may have been as grouchy and bored as she was until the museum began to turn itself inside out. 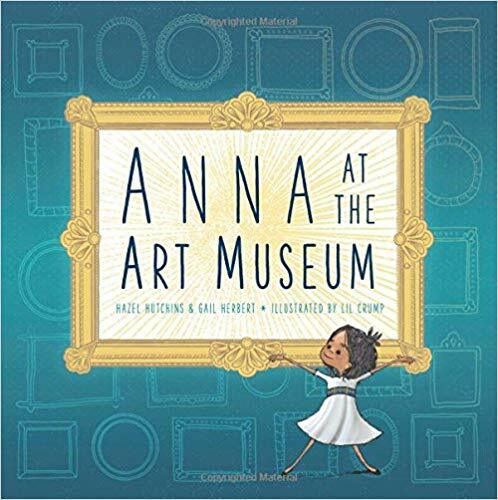 Drawn with quirkily attractive illustrations, Anna at the Art Museum will have children and adults alike paying way more attention to the artwork than they would normally. Each piece of art is a photographic reproduction carefully woven into the illustrations. A fantastic touch is the Section, About the Art, where each picture artwork is shown again with its title, period, artist, and art medium. I think this book would be a great lead-in to a field trip to a similar museum. Highly recommended for the sheer joy of the sly humor, illustrations, art work, art lessons, and portrayal of a typical young girl finding joy in a museum. Way too much fun! A half-open door draws Anna’s attention, but the No Entry sign means yet again that it’s off-limits. This time, however, the guard surprises her by inviting her to go in. Here she finds a “secret workshop” where paintings are being cleaned and repaired. Staring out from one of the canvases is a girl who looks grumpy and bored―just like Anna herself. With the realization that art often imitates life, Anna discovers the sheer joy to be had from the paintings on the wall, especially those that reflect what is happening all around her. Filled with representations of paintings from many world-class galleries, this charming book is the perfect prelude to a child’s first visit to an art museum.